Thomas Jordan was born about 1600 in England. He arrived in Jamestowne, Virginia on the ship Diana in 1623/24. He was a soldier in the Governor's Guard at James City in 1624, and represented the Isle of Wight County in the Virginia House of Burgess in 1628, 1629, 1632. Thomas received a Patent for 900 acres in 1635 near the head of the Warrasquioake River. His wife is not known. Thomas had two children, Dorothy and Thomas, Jr.
"The Jordans became the leading family of Quakers in the Isle of Wight and Nansemond Counties and their tribulations under the Virginia legislative enactment of 1662 for suppression of the Sect are well recounted in the Quaker records." Richard Jordan, born 1670 was the son of Thomas Jordan and Margaret Brasseur. Richard was a Quaker and married Rebecca Ratcliff in 1706, also a Quaker. Richard owned 174 acres in the Isle of Wight and died in 1723. Richard and Rebecca had a son, Joseph Jordan who later later moved to Rich Square, Northhampton County, North Carolina. Joseph Jordan of Northhampton County married Patience Ricks, of the Isle of Wight County, in 1746. Patience was a Quaker, and descended from the Quaker families of Abraham Ricks, Edmond Bellson, and James Tooke. The Tooke family came from Essenden, Hertfordshire, England. Joseph and Patience had seven children, one of which was Mary Jordan. Mary Jordan was born in 1750 in the Isle of Wight County and married William Newsome in Northhampton County. William Newsome possibly descended from the Newsome family of Newsome Hall, Lancashire, England. William was born about 1746 in Northhampton County and was a Quaker. William and Mary moved to Dobbs County, North Carolina in May of 1772. This part of Dobbs County became Wayne County in 1779. By about 1785, William and Mary had left the Quaker faith. William and Mary Jordan Newsome had a son, Joab Newsome who was born in Northhampton County in 1770. 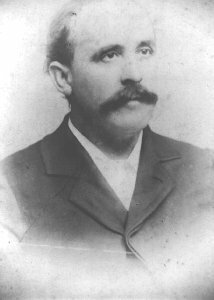 Joab Newsome moved to Wayne County and married Elizabeth Barnes. Joab had extensive land holdings in Wayne County, and like his father settled along Basses and Penright's Swamp-near the present day Fremont, North Carolina. Joab and Elizabeth were of the Baptist faith. They had a son, Simon Newsome who was born 1797 in Wayne County. Joab died 1829 in Wayne County. Simon married Patience Best. Simon received land from his father and there are extensive records in the N.C. Department of Archives in Raleigh concerning Joab and Simon. Reddin Newsome born 1825, was the son of Simon and Patience. Patience Frances Newsome married Elder Patrick Thomas Lucas (shown right ) born 1854 in Wayne County. They had 12 children and are the ancestors of many of the Lucas family of Wilson, Wayne and Nash Counties.